APRIL 23RD, 1864: The CSS Alabama, Captain Semmes, captured and destroyed the ship Rockingham with cargo of guano at sea west of the Cape Verde Islands. Semmes said of the capture: "It was an old spectacle of the panting, breathless fawn, and the inexorable stag-hound. A gun brought his colors to the peak, and his main-yard to the mast ..., We transferred to the Alabama such stores and provisions as we could make room for, and the weather being fine, we made a target of the prize, firing some shot and shell into her with good effect and at five p.m. we burned her and filled away on our course." 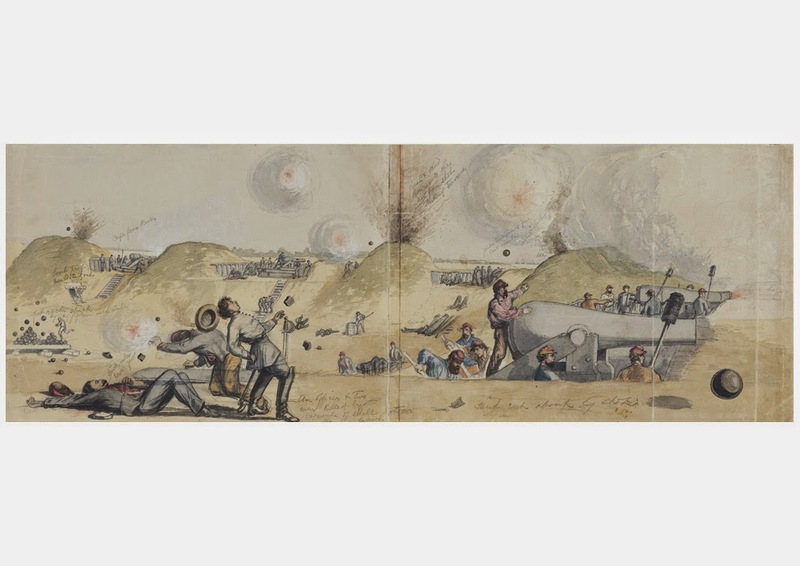 Ominously, during his gunnery practice, many of the Alabama's shells failed to explode. From the April 11, 2019, Hampton Roads (Va.) Daily Press "Notes and Notables: Area codes, local history and local shopping." When the gun turret from the ironclad ship USS Monitor was pulled up from the Atlantic on August 5, 2002, one historian compared its significance to that of the Apollo 11 module that delivered Neil Armstrong and Buzz Aldrin to the lunar surface. That's how much the rotating turret -- which sunk with the rest of the Monitor off the coast of North Carolina at the end of 1862 -- changed the rules and strategies of naval warfare. That 120-ton turret now sits at the Mariners' Museum in Newport News, along with the ship's anchor, propeller and thousands of smaller artifacts that have been retrieved. A painstakingly meticulous conservation effort continues on the turret -- this past week it was lifted about two inches so that the 17-year-old support apparatus could be replaced with a new one that will provide better access. The concern caused by the attack on the USS Minnesota, coming so soon after Confederate submarine Hunley had sunk the USS Housatonic was widespread. William Winthrop, U.S. Consul at Malta, wrote Assistant Secretary of State Frederick W. Seward (was he a relation of William Seward?) concerning precautions recommended for the future. "In these days of steam and torpedoes, you may rest assured that outlying picket boats and a steam tug at all hours ready to move are not sufficient protection for our ships of war, where a squadron is at anchor. They require something more, and this should be in having their own boats rowing round all night, so that in a measure every ship could protect itself. "If this precaution be not taken, any vessel in a dark and foggy night could be blown out of the water, even while a watchful sentry on board might still have his cry of "all's well' yet on his lips as the fiendish act was accomplished." Little damage resulted, though "the shock was quite severe." Nevertheless, as Confederate Secretary of the Navy Mallory later said of the attack: "The cool daring, professional skill, and judgement exhibited by Lieutenant Davidson in this hazardous enterprise merits high commendation and confer honor upon upon a service of which he is a member." As the Minnesota reeled under the blow, the fate of the seven Southerners aboard the Squib was gravely imperiled, for their tiny craft was sucked under the port quarter of the Union ship. As the Minnesota rolled back to port, however, Curtis reported, "the pressure of the water shoved us off." But they were still so close to the Minnesota, that Curtis leaped on the torpedo boat's forward deck and pushed against the Union ship to get the small craft clear. The Squib escaped under heavy musket fire. The nearby Union tug Poppy did not have steam up and could not pursue the Confederate boat which withdrew safely up the James River. Davidson, a pioneer in torpedo warfare, was promoted to commander for his "gallant and meritorious conduct." Continued from April 9, 2019. This happened off Newport News, Virginia. The USS Minnesota (one of the most powerful ships in the Union Navy) attempted to open fire, but the distance between the two ships being so close, her guns could not be brought to bear. The Squib rammed her powder charge of more than fifty pounds into the Minnesota's port quarter. The log of the Minnesota recorded: "... a tremendous explosion followed." John Curtis, second in command of the Squib, wrote that he closed his eyes at the moment of impact, "opening them in about a second, I think, I never beheld such a sight before nor since. The air was filled with port shutters and water from the explosion, and the heavy ship was rolling to the starboard, and the officer of the deck was giving orders to save yourselves and cried out 'Torpedo, torpedo!' "
Today marks the 77th anniversary of an event that, though it didn't change the course of the war between Japan and the United States, it had a huge impact on the morale of both sides. Sixteen American B-25 bombers took off from the aircraft carrier USS Hornet and launched a surprise attack on the Japanese homeland. If the Japanese could launch a surprise aircraft carrier attack on the U.S. at Pearl Harbor five months earlier, the United States could repay the favor. Doolittle's Raiders did some damage, but not a lot. But, this was huge for American morale as we had little to cheer about at this point. It was one defeat and loss after another in the Pacific and U-boats prowling off the east and Gulf coasts were sinking ships on a regular basis. For the Japanese, it was an awakening that they were not safe from the Americans. The last member of the Doolittle Raiders, Richard Cole, died nine days ago, at age 103. APRIL 17TH, 1864: Confederate troops launched a sustained attack on Plymouth, North Carolina. Union gunboats moved to support their troops ashore and were promptly taken under fire bu the Southern batteries. Next day, the fighting at Plymouth intensified as the Confederates pressed the assault. The Union Army steamer Bombshell, commanded temporarily by Acting Ensign Thomas B. Stokes, was sunk during the action, but at 9 o'clock in the evening, the Southern advance had been halted. Lieutenant Commander Flusser reported: "The Southfield and Miami took part and the general says our firing was admirable," The Southern attack required naval support in order to achieve success, and Flusser added meaningfully: "The ram [Albemarle] will be down to-night or to-morrow." The color of the tower is red, and the focal plane is 156 feet above the level of the sea. The keeper's dwelling, which is part of the old tower, is painted red with white horizontal stripes. The illuminating apparatus is a catadioptric Frensel lens of the first order, showing a fixed light of the natural color, which should be visible in ordinary weather a distance of 22 nautical miles. The new light-house will be lighted for he first time at sunset on Tuesday, the first day of November next, and it will be kept burning during that and every night thereafter until further orders. Of course, it was turned off less than two years later. So, the original color was red, instead of the diamonds associated with it today. Labels: Cape Lookout (NC) Lighthouse, Coast Survey, lighthouses, Whiting William H. C.
An announcement about the completion of the North Carolina lighthouse was run in several newspapers. The one below is from the September 28, 1859, issue of the the Constitution, a newspaper from the District of Columbia. It is a notice from W.H.C. Whiting, Corps of Engineers of the United States Army that the lighthouse was fully complete. Official information has been received at this office from Captain W.H.C. Whiting, corps of engineers United States army, that the new light-house at Cape Lookout has been completed. The tower is a frustum of a cone. It is built of brick, and is surmounted by an iron lantern painted black. Labels: Army Corps of Engineers, Cape Lookout (NC) Lighthouse, lighthouses, newspapers, Whiting William H. C.
From NCGENWEB PROJECT October 10, 2009, "Cape Lookout Lighthouse Anniversary." By Taneya Koonce. Family researcher Mark Green posted about this . His ancestor Joseph Fulford donated the land for the lighthouse back in 1805. October 10, 2009, marks the 150th anniversary of the second (and still current) lighthouse which was built under the auspices of Captain W.H.C. Whiting, Corps of Engineers of the United States Army. That would be our W.H.C. Whiting of Wilmington and Fort Fisher fame. They failed to bring the light house down, but did significant damage to it. L.C. Harland's attempt destroyed the light house oil supply and damaged the iron stairs on the interior. With iron unavailable during the war, the damaged sections of iron were replaced with wooden ones. The Fresnel lenses from all over North Carolina were found at Raleigh in 1865. The lenses were shipped back to their original manufacturers to be checked out and repaired. In 1867, the temporary wooden stairs were replaced with iron ones and the original first-order Frensel lens was reinstalled. In 1873, it was painted in its distinctive black and white diagonal, checkerboard, or diamond, pattern. I mentioned this in the last post. This lighthouse was designed and construction overseen by Captain W.H.C. Whiting, U.S. Army Corps of Engineers at the cost of $45,000 and lit November 1, 1859. It was the second lighthouse at the site and it still stands. It had a first-order Fresnel Lens which allowed the light to shine brighter. On May 20, 1861, North Carolina seceded from the United States. All lenses were removed from coastal lighthouses as well as navigational beacons to prevent Union forces from using them to navigate southern coasts. Union forces captured Beaufort and Morehead City, N.C. in 1862 and by the end of the the next year they had a 3rd-order Fresnel Lens installed in the Cape Lookout Lighthouse. On April 2, 1864, a small group of Confederates under the command of L.C. Harland were able to get out to the lighthouse with intent to destroy it. They failed. Labels: Beaufort N.C., Cape Lookout (NC) Lighthouse, North Carolina, Whiting William H. C.
From the N.C. Civil War Sesquicentennial 150 site. Timeline. All events are in the eastern part of North Carolina unless otherwise noted. APRIL 1-- Skirmish near Plymouth. APRIL 2-- Affair at Cape Lookout. Destruction of the lighthouse there. APRIL 5-- Affair near Blount's Creek. APRIL 17-- Skirmish at Beaver Creek. A career officer in the United States Air Force. He was one of the airmen who took part in the Doolittle Raid, April 18, 1942, serving as the co-pilot to Jimmy Doolittle in the lead airplane on the raid. He eventually reached the rank of lieutenant colonel. Cole remained in China after the raid until June 1943, and served again in the China Burma India Theater from October 1943 until June 1944. He later served as Operations Advisor to the Venezuelan Air Force from 1959-1962. He retired from the Air Force in 1916 and became the last surviving Doolittle Raider in 2016. APRIL 9TH, 1864: Confederate torpedo boat Squib, Lieutenant Hunter Davidson, , successfully exploded a spar torpedo against large steam frigate USS Minnesota, Lieutenant Commander John H. Upshur, off Newport News, Virginia. The Squib was described by Acting Master John A. Curtis, second in command of the torpedo boat, as being constructed of wood, "about thirty-five feet long, five feet wide, drew three feet of water, two feet freeboard; designed by Hunter Davidson.... The boiler and engine were encased with iron; forward of the boiler was the cockpit, where the crew stood and from where we steered her." The attack, described by a Northern naval officer observer as "a deed as daring as it was vicious", took place about two o'clock in the morning. The officer of the deck saw a small 150 to 200 yards off, just forward of the port beam. To his hail, the Confederate answered "Roanoke." Acting Ensign James Birtswistle ordered her to stay clear. Davidson answered "aye, aye!" Although Birtswistle could discern no visible means of propulsion, the small Confederate boat continued to close the Minnesota rapidly.